This book review of "When Breath Becomes Air" written by Paul Kalanithi is by Virgie DeNucci, bookseller at Off the Beaten Path Bookstore. This review was originally was published in Steamboat Today. This week's book review of Lindsey Stirling's and Brooke S. Passey's , "The Only Pirate at the Party" is by Shane Kinney, bookseller at Off the Beaten Path Bookstore. This review was originally was published in Steamboat Today. This week's book review of Garth Risk Hallberg’s debut, “City On Fire" is by Logan Farmer, bookseller at Off the Beaten Path Bookstore. This review was originally was published in Steamboat Today. 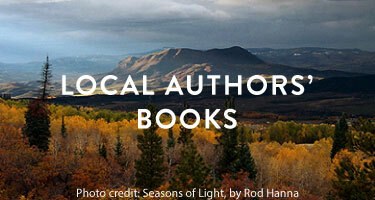 After meeting acclaimed author Ron Rash at the 2013 Literary Sojourn, I vowed to read everything he publishes. I appreciate Rash’s work for his ability to mesmerize with atmospheric language and develop characters that haunt the reader long after closing the pages. Rash is a master of the southern gothic genre, and his latest novel, “Above the Waterfall,” published Sept. 8, fulfilled my high expectations. If you had asked me as a child what I wanted to be when I grew up, I would have said what many children at the time said: a SeaWorld Trainer. Emily O’Neal is technical services/collection management librarian and Bud Werner Memorial Library. This is the story of the Cross family in 1886. John Cross is a New York architect who benefits from the help of his aunt, Caroline Astor. With this connection, the Cross family is quickly becoming part of New York City's elite society, with many events to attend and people to see. Jennie Lay offers a review of two books to end your summer reading list, "Circling the Sun" by Paula McLain and "Big Magic" by Elizabeth Gilbert. Ms. Lay is the adult programs coordinator at the Bud Werner Memorial Library. Alice Hoffman uses rich, colorful prose in this historical, fictional novel about the life of a very strong-willed woman and her equally strong-willed son. "The Marriage of Opposites" is one of those books that keeps giving back days and weeks after reading it. Steamboat Pilot and Today review by Candace Pederson, bookseller at Off the Beaten Path Bookstore. This week's book review of "A Little Life" by Hanya Yanagihara is by Logan Farmer, a bookseller at Off the Beaten Path. The review was first published in Steamboat Today.